We have gathered a regular list of routes that our club rides take us out on. Scenic ride out to the lovely village of Chiddingstone where the excellent local cafe or the cafe in the Castle await. Out via a peaceful climb up to Goathurst Common and back via the pretty Ightham Mote. Short loop with lots of variety taking in a lot of the lovely country lanes around Knatts Valley and into the Weald. Highlight is Fackenden Lane which is like a mini-Ditchinling Beacon followed by a long steady shallow climb to the top of Row Dow – the easy way. Cafe stop at Ide Hill if refreshments are required. Affectionately know as Terry Sowa’s Lumps n Lanes – this has been a great route that Terry put together to showcase some really off-the-beaten-track lanes and some excellent hills. In particular the private road – Trevereux Hill – which bikes are allowed up and wow is it tough! It’s the real treat of this route. This route is suitable for winter months when roads are icy – it takes in roads which are on the KCC gritting routes. This route takes you up to the top of Ashdown Forest to the Llama Park – where there is a nice cafe and some hard to spot llamas. Lovely loop out that never strays too far from home, out to “The most romantic cafe in Kent” at the lovely village of Chiddingstone. Sting in the tail with return via Carters Hill. This is a relatively flat route – with an instant warm-up up Cudham Lane. Amazing breakfasts at the Farm – good all year round. The Priory is a really peaceful spot – so long as there is no event on there – check before going. Great value cafe. This route out via The North Pole is quite challenging but a lot of fun. This is a great rolling route out to Bewl Water, taking in Ide Hill, Penshurst, Groombridge, then a fast roll through to Bewl – but not into the main area – into Beals Barn – a great little cafe with lovely views over the water itself. The return takes in a lot of the same lanes as the return from Rye. The Wall is a cycling must-do – if you haven’t ridden up it – take a ride out there – it’s a perfectly straight, steep wall of tarmac that never seems to end – until it does and you pop out at the top of the Ashdown Forest. There used to be a great cafe in Hartfield – now the alternative is Penshurst Place which is also nice – quite posh. This has long been our regular trip to the coast. 100 miles of reasonably flat terrain – ensure you eat plenty but not too much at the stop – it’s a long way home to be digesting a big fry-up. 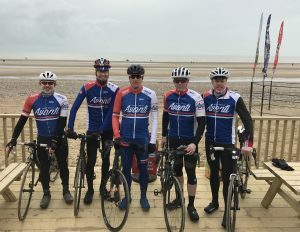 This is pretty much the same as the Rye route with a bonus 20 miles to take you to The Kit Kat Cafe for breakfast on the beach – great in good weather. There is a lovely pan-flat section that you sometimes get a tailwind on from Old Romney to Brenzett: https://www.strava.com/segments/3277956?filter=overall. This makes up for missing out on the Military Rd.